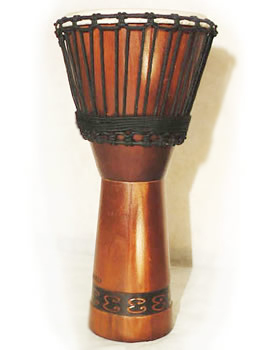 The Djembé (or yembé) is an African percussion instrument, very popular in countries like Senegal, Ivory Coast, Guinea, Mali or Burkina. It is built in wood and the patch is made of goat leather. Its tension system is traditional with ropes and metal rings. Its height is around 65cm and the diameter is approximately 31 centimeters. 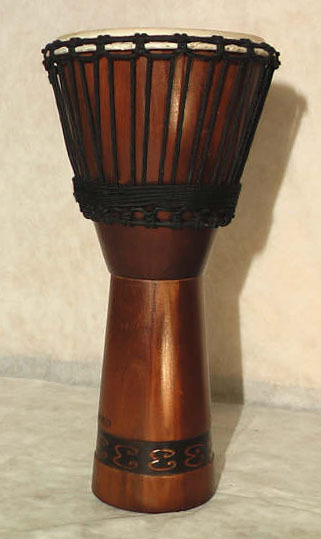 The Djembé is a percussion instrument belonging to the family of membranophonic instruments and can be found with the following names: dyembe, djembe, yembe, yimbe, sanbanyi, tam tam, etc. It is believed to have originated in 900 BC in the tribe of the Maninka, meaning people of Mande, although there are those who date that origin in the 1300 BC. Mande would be located at present in Mali, not in vain Mali is a deformation of the word Mande and Malinke (the latter synonymous with Maninka). From here the djembé migrated to other areas such as Senegal, Nigeria, Guinea, Ivory Coast and Burkina Faso. It is believed that it was created by Numu, wood carvers craftsmen, who were considered the guardians of certain powers. They were in charge to sculpt the body of the djembes and to touch them. The djembe is known in these places as the healing drum for its great power, it was used in sacred rites, births, weddings and funerals, accompanied by other instruments such as dundun, balafón or shekere. Has different rhythms, very rich and varied, we can name some as: MANDIANY, was played in agricultural work. 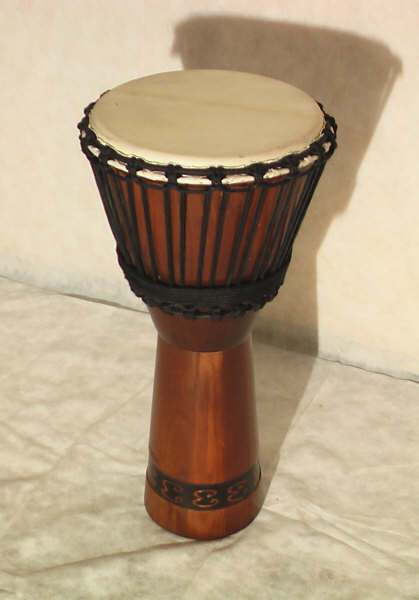 DOUNUMBA, is played at weddings. WOLOSODON, this one is played in baptisms and in the ceremony of the circumcision. The original rhythms of the djembé have been changing over time, adapting to modern times and integrating with other types of music. The way in which rhythms such as SUNU or DOUNDUMBA have been transmitted from generation to generation for centuries has been through the complex syllabic and vocal system of African languages. The teachers sang the rhythms to their students and they practiced them. The djembé (djembé players) and dunumistas (dunums players) accompany a base rhythm. The women and their young daughters sing and clap. The people involved in the ceremony enter the circle and perform the steps of the dance. During the dance (with established or improvised steps, according to the ceremony) the soloist DJ, or more rarely solo dunumista, has to improvise musical phrases (or use phrases that correspond to that dance) on the base rhythm played by the others Instrumentalists, always following with the eyes to the dancer or dancer, so that its improvisation gives a perfect support to the steps of the dance. - The first djembé plays a basic rhythm. - The third djembé is the soloist. When he does not improvise he supports and reinforces one of the accompanying djembés. - The Kinkeny gives time with a simple rhythm. - The sangbang is superimposed on the base accompaniment of the first djembe with, in addition, a bell phrase. He is also the occasional dunumista soloist. - The dunumba plays the most serious notes, with, in addition, a bell phrase. The mixture of the three dunums gives its particularity to the polyrhythmia (at the level of the dunums). 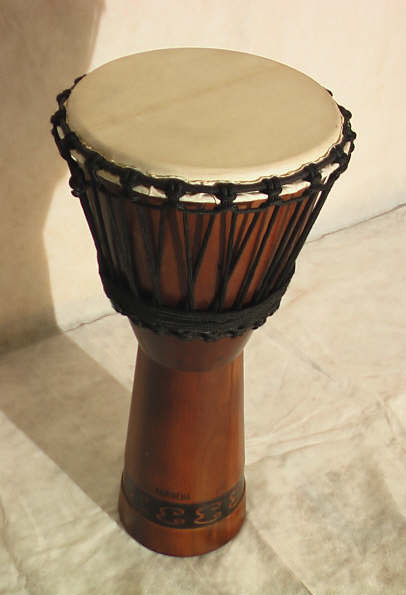 The characteristics of each polyrhythmia depend on three factors: the particularity of the djembe section, the particularity of the dunum section and the overlapping of the two sections. 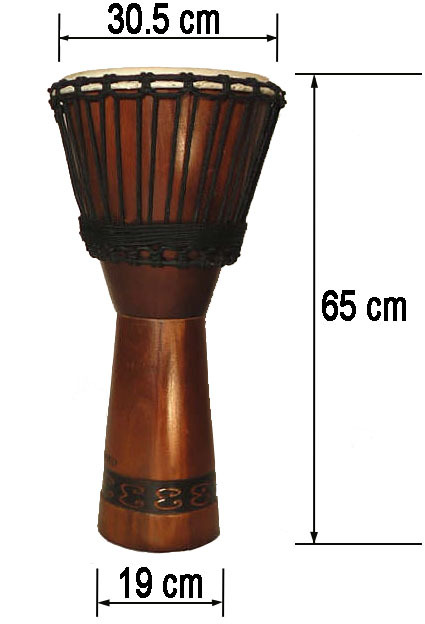 We are currently manufacturing the Djembe with a patch measurement of 30.5 centimeters in diameter, 65 centimeters high, by 19 centimeters of lower mouth. We built it with eucalyptus wood parked, specially selected goatskin and treated for long life and intensive use (without hairs so that it does not absorb the sound), and a traditional tensioning system with ropes known as diamond knot (rope reinforced with nerve internal). Its dimensions are optimal to be executed seated, or standing on a leash. 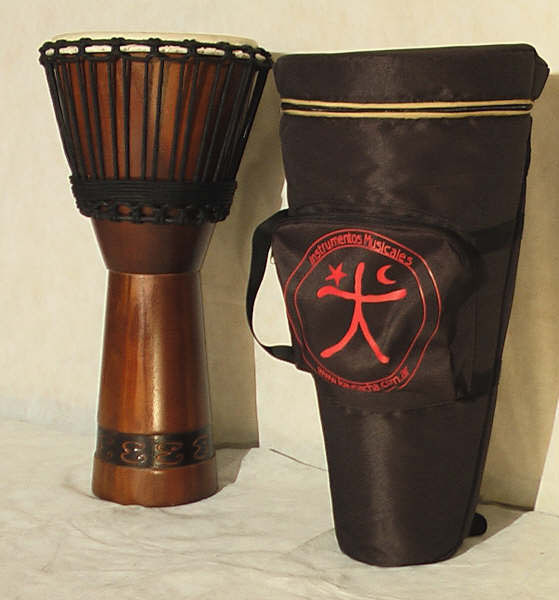 Currently both models of Djembé we are selling them with a padded cover inside, waterproof, with slider type backpack to carry it easily. , you can write us in the section CONTACT to know about it or to acquire it, Thank you.